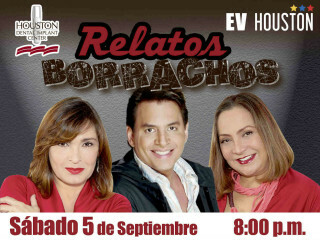 EV Houston Newspaper presents Relatos Borrachos, from the pen of writer/director Enrique Salas and a cast made up of the first ladies of Venezuelan theater: Elba Escobar and Alba Roversi, and actor and entertainer, Daniel Sarcos. Stories, experiences and testimonies in which we recognize ourselves and, through laughter, get confronted while amused. With humor and without prejudice they will pose different situations that we experience while under the influence of alcohol.